Quinoa – pronounced “KEEN-WA” is a grain incredibly high in protein & fibre. Another super benefit – is that it is entirely wheat-free, meaning that it a great alternative to starchy grains! Predominately grown in South America, the cooked quinoa seeds become fluffy and creamy, yet maintains a slight crunch. With delicate and subtle nutty flavor, it is truly versatile – the perfect ingredient for breakfast (as a cereal), lunch (as a salad) or dinner (as a side). Steffie from Beetgraag created a healthy dinner of quinoa, broccoli, cauliflower & mushrooms. While Elien & Robbe of Een Bord Vol shared Peppers stuffed with quinoa, chicken & pesto. Geertrui of Truitjeroermeniet give us Coconut quinoa with lime zest & pomegranate seeds. And Sarah of South & Pepper makes a yummy Quinoa treat with berries & greek yoghurt. And finally, Ellen of Kokerellen has a quinoa salad with peas and asparagus. 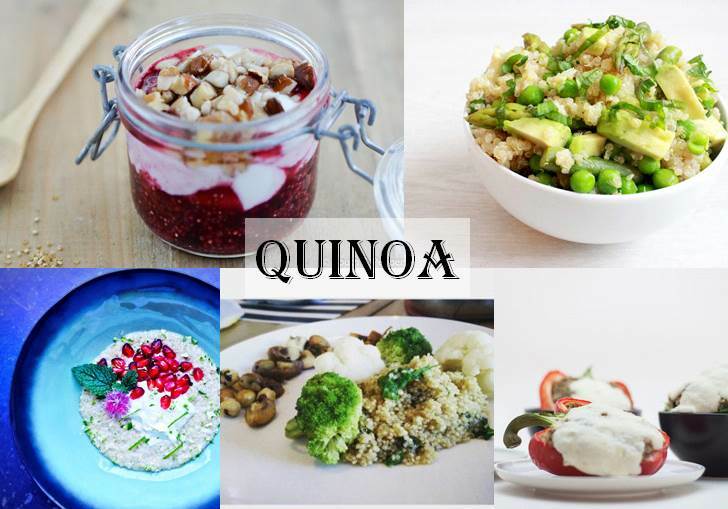 Do you have an quinoa recipe that you wish to share with us? Just add the link to the comments section below!